Here it is! The last ever page for The Carpet Merchant. When I first started working on TCM I never expected it to become the giant ambitious epic that it is now. It was meant to be a 150 paged work! It was meant to be a simple backstory for one of my main characters in TWiDI! 668 pages and one Eisner nomination later…well, clearly, this is the work it’s meant to be. I don’t know if I can ever call it my magnum opus, but it is very special to me. I love every step of the process, even if the details sometimes drive me nuts, and I love the characters, and what this story represents – a story of hope, kindness and faith in this world of cruelty and indifference. TCM feels like a project I’d be proud of for the rest of my life, even if I’ll grow and change and make new stories. 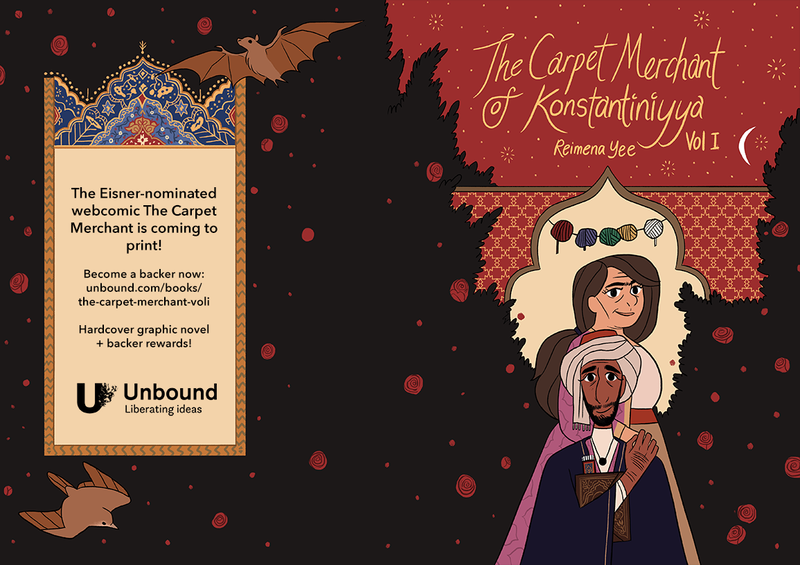 If you want to see The Carpet Merchant as a print book, please help make it possible by backing the crowdfunding campaign for the publication of Vol I. If the campaign succeeds you will receive a hardcover copy, as well as other exclusive goodies. And with that, until the next story, I’ll see ya some time. What’s going to happen to TWiDI? I understand this is the end of his backstory but will we get to see more of him???? I’m soo excited and proud of you. I love love this story! Thank you for all your hard work. TWiDI is still on (if you check the front page there’s the title of the upcoming story)! There will be more stories feat Zey and the rest of the cast, just not at the present time or the near future. Gotta write a bunch of things this year!! I just finally sat down and binged the entire remainder of this story right now over (a very long) lunch, and i am in tears… the depth of love, and forgiveness, and pain and gentleness is so strong, and the love of the art, the time and culture, and characters is overwhelming, in a good way!! I love how poetic it is, both in the actual poetry included, as well as the art itself and how it flows. This is definitely one of my favorite things i’ve read this year and I am definitely pledging to the book! THanks so much for creating this wonderful work! I discovered this story just a couple of month ago and I was so amazed by the quality of the storytelling, the art and how great the characters were. I rarely find a story that has such a perfect mix of hope, sadness and beauty in it. I am quite bad at puting feelings into words (which is why this is my first comment here, sorry about that …) but seeing that sweet vampire grow was one of the most heartwarming story I had the chance to read in a while. It was also great to get to learn so many things about a culture that is so different (and yet not that much!) from mine. So thank you so much for this amazing story, I can’t wait to have the physical copy of the book so I can throw it at people to make them read it (or more probably, put it gently in their hands, who knows, it might work too). Reimena, thank you for blessing us with such a touching and beautiful tale. 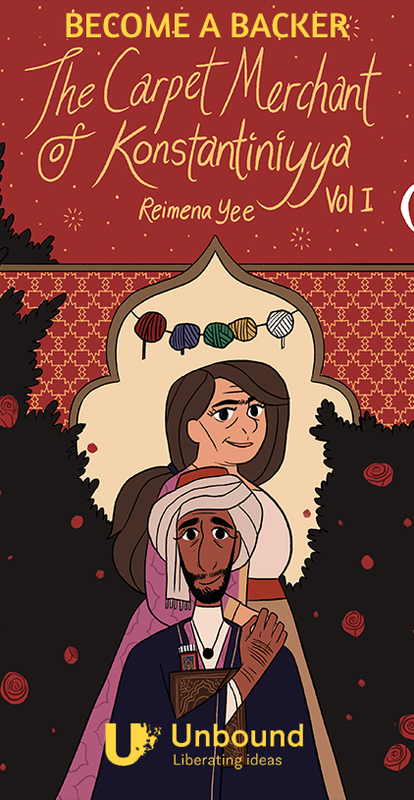 I may have only found this gem last week, but since then I have found myself undeniably drawn to the story, voraciously taking in all that I could learn about Zeynel, Ayse, Mora, Alfie, and the colorful tales that surrounded them all. I can say with certainty that this story has changed me for the better; you are a role model by now, inspiring me to go all in when I do something I love. 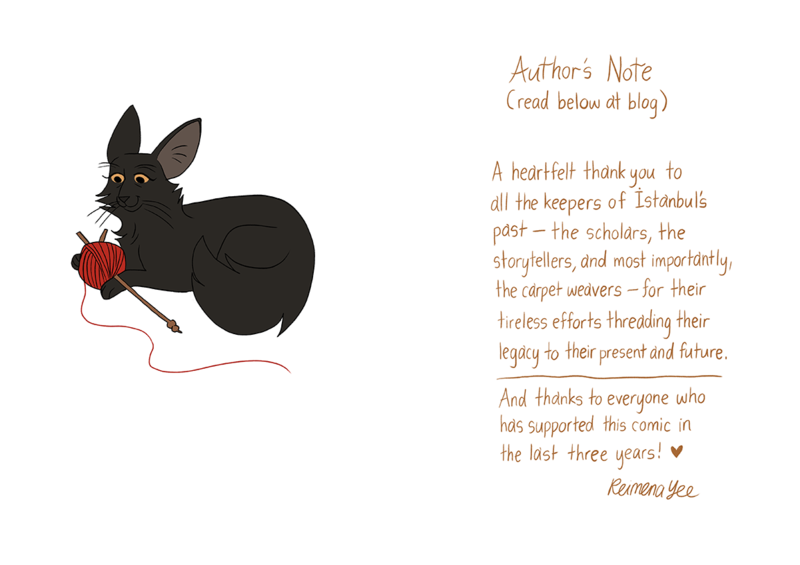 So many thanks from me; you are a talented weaver of tales (like Safiya!) and I am happy to say that when given the opportunity I will do what I can to ensure the success of the carpet merchant.